Mystery drawer - Joakim A. We all have a drawer in which we put all the miscellaneous items we have nowhere else to put. It’s the perfect solution. All the weird things are hidden from sight and promptly forgotten. I was cleaning this drawer the other day and I found this. 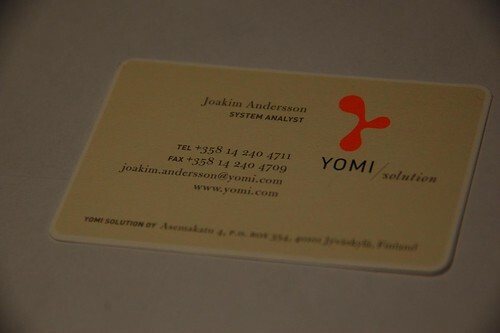 It’s the business card I got at my first job eight years ago. There was no chance I would use up the huge piles of cards I got, so for a while I used to write the grocery shopping list on the backside. But in the end the cards got placed in the “mystery drawer” never to be used again. 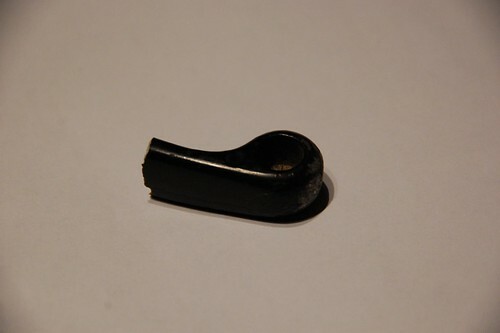 Another thing I found was a piece from the brake handle of the scooter Camilla rented on Kalymnos. The easiest way to get around on the Greek islands is usually to rent a scooter. However, if you haven’t driven one before it can be a harrowing experience. Especially going up or down the steep gravel hills to the climbing crags. That’s what happened to Camilla. Being careful she was going a bit to slow downhill and the slower you go the trickier it is to keep the heavy scooter in balance. So she wanted to stop. However, stopping in the middle of a steep downhill section is hard if not impossible for us inexperienced bikers. The result was that she and the scooter toppled over. Luckily she didn’t get hurt and all that happened to the scooter was that the piece of the brake handle you can see above fell off. When returning the scooters we charmed the guy renting us the scooters and told him a story of the scooter falling over when parked in the soft gravel at some crag so we got out of paying for the broken handle.